"Indian Army is deeply involved in the Rescue and Relief operations in Kerala which is witnessing very heavy rains since August 9, 2018. The Indian Army has rescued 3,627 persons, including 22 foreign nationals in the flood-hit Kerala. 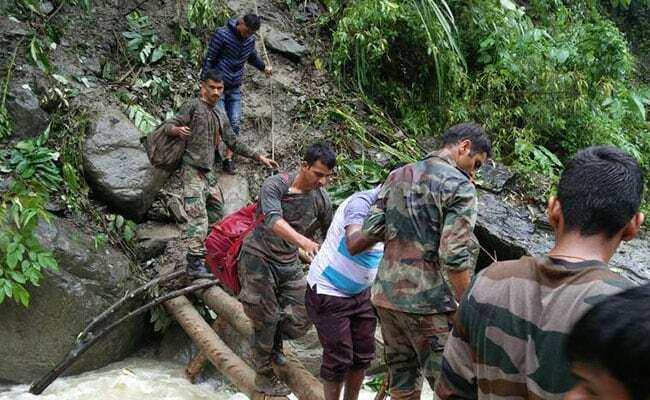 Engaged in rescue and relief operations in flood-hit Kerala, the Indian Army has been able to rescue 3,627 persons till date, including 22 foreign nationals, the Ministry of Defence said on Friday. With an over 1,000 persons-strong rescue team, the Army is engaged in alleviating the situation in flood-battered Kerala since August 9 when it was hit by torrential rains. Rain has continued ever since leading to worst flooding in over a century. "Thirteen temporary bridges were constructed to reconnect 38 remote areas and total of 3,627 persons have been rescued till date, including 22 foreign nationals. "Relief materials have been sent to 19 villages with medical aid being provided to approximately 500 civilians. In addition, 3,000 pre-cooked meals and 300 life jackets have been handed over to civil administration on Friday," the Ministry of Defence said in a statement. The Army is engaged in the relief efforts on a "war footing" with the deployment of 10 flood relief columns, each having an approximate strength of 65 personnel in 10 districts, the statement added. It has also engaged 10 Engineer Task Forces, each having about 45 personnel, to restore connectivity to remote villages through temporary foot-bridges and other means. "The Indian Army carried out execution of disaster relief tasks on a war footing which has been greatly appreciated by civilian populace and the state administration," the Ministry said.